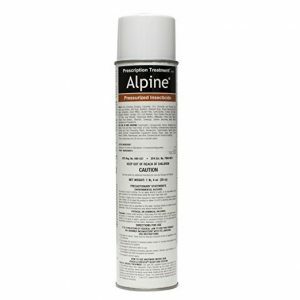 PRODUCT DESCRIPTION: Compared to ordinary sprays that kill quickly and tend to "repel" insects, Alpine uses a slow working, stealthy active insect pests cannot detect. It will take a day for pests to die and they won't "run away" when sprayed but they will die!! Low to no odor and a virtually invisible residue when used properly makes Alpine aerosol a great pro duct for spot treating open areas. Pests are exposed to the active ingredient either by ingestion or contact and once exposed, will unknowingly expose it to other insects back at their nest. This will allow the active to be "shared" and in turn, kill many more as they become infected. WHERE TO USE: Apply as a spot and/or crack and crevice and/or void treatment where pests harbor, nest, trail, run, and/or breed or hide. Treat voids or surfaces beneath cabinets, furniture, spaces between equipment, expansion joints, surfaces behind sinks, floor drains (to sewers), lockers, and water pipes. Exterior treatments around the listed areas are limited to spot and/or crack and crevice treatments where pests enter around doors, windows, eaves, attic vents and holes in exterior walls where utilities enter. WHEN TO RETREAT: As explained above, Phantom is not a fast acting product and for this reason, many people tend to over use it thinking its not working. But in most cases, treatments will last at least 2 weeks if not 4 weeks. So a good rule to follow is to renew treatments every 2 weeks if pests remain active but if they disappear, don't treat again for at least a month. And if you follow this "once a month" routine, its not likely any pests will return.